This creamy white fudge recipe is perfect for those who love the flavor of ginger. 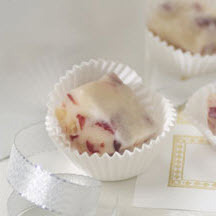 Featuring crystallized ginger and dried cranberries, this fudge makes an attractive and sweet holiday gift. Line 8 or 9-inch-square baking pan with foil. Combine sugar and ground ginger in medium, heavy-duty saucepan. Add evaporated milk and butter. Bring to a full rolling boil over medium heat, stirring constantly. Boil, stirring constantly, for 4 to 5 minutes (to 234ºF). Remove from heat. Stir in marshmallows, morsels, cranberries and crystallized ginger. Stir vigorously for 1 minute or until marshmallows are melted. Pour into prepared pan; refrigerate until firm, about 1 1/2 hours. Lift from pan; remove foil. Cut into 48 pieces. Tip: Crystalized ginger can be found in the spice aisle of the grocery store.